Home Department Punjab, under section 144 CrPC has banned the entry of irrelevant persons within the radius of 100 meters of examination centres set up for BA/BSc (Part I-II) Annual Examination under the aegis of Punjab University Lahore in Faisalabad division and other parts of the province. 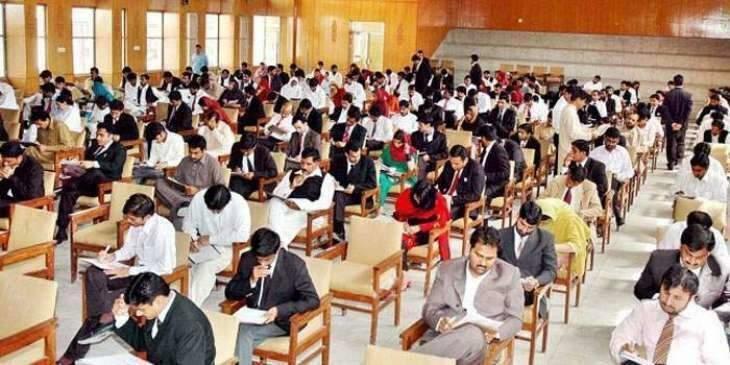 FAISALABAD, (UrduPoint / Pakistan Point News - 17th Apr, 2019 ) : Home Department Punjab, under section 144 CrPC has banned the entry of irrelevant persons within the radius of 100 meters of examination centres set up for BA/BSc (Part I-II) Annual Examination under the aegis of Punjab University Lahore in Faisalabad division and other parts of the province. Under this order, carrying books, guide books, solved papers, other relevant material, digital diaries, mobile phones and weapons, will also be banned, a spokesman of local administration said here on Wednesday.